I am an assistant professor at the UCLA Anderson School of Management. My main areas of interest are organizational economics, public policy, and technology. My research is published in PNAS and the Journal of Financial Economics. My work has been covered by The New York Times, The Washington Post, NPR, The Atlantic, Slate, and Bloomberg. 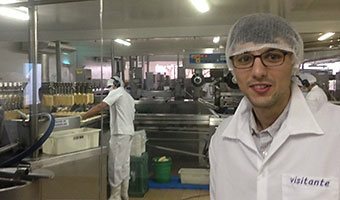 Touring an ice cream factory in Brazil. I am no longer on the academic job market and will update this website sometime in the coming months. Who benefits from technology adoption in the workplace? To explore, I combine worker-level wage data with information on broadband adoption by Brazilian firms to estimate the effects of broadband on wages. Overall, wages increase 2.3 percent following broadband adoption. Consistent with the theory of biased technological change, wages increase the most for workers engaged in non-routine cognitive tasks and returns are negative for routine cognitive tasks. There is no effect of broadband adoption on wages for either routine or non-routine manual tasks. Additionally, I estimate the effect of broadband on selected quantiles of the within-firm wage distribution and find evidence that within-firm wage inequality increases following broadband adoption. Both new hires and the firm's existing employees benefit from broadband adoption, which indicates that broadband's effects are not driven only by better recruitment of new employees. Handgun waiting periods are laws that impose a delay between the initiation of a purchase and final acquisition of a firearm. We show that waiting periods, which create a "cooling off" period among buyers, significantly reduce the incidence of gun violence. We estimate the impact of waiting periods on gun deaths, exploiting all changes to state-level policies in the Unites States since 1970. We find that waiting periods reduce gun homicides by roughly 17%. We provide further support for the causal impact of waiting periods on homicides by exploiting a natural experiment resulting from a federal law in 1994 that imposed a temporary waiting period on a subset of states. We use a U.S. Supreme Court case, Morrison v. National Australia Bank (2010), as a natural experiment to test the legal bonding hypothesis. By decreasing the potential liability of U.S.-listed foreign firms, particularly due to class action lawsuits, Morrison arguably eroded their legal bonding to compliance with disclosure duties. Nevertheless, we find evidence of an increase or insignificant change in share values. Tests of longer-run effects of the legal event indicate that foreign firms' disclosure quality and likelihood of facing enforcement actions remained stable, as did investors' revealed preferences for trading on US markets. These results go against the legal bonding hypothesis but are consistent with reputational bonding and with market-based accounts of US cross-listing. Our results may contribute to ongoing debate about civil enforcement of securities laws through class actions. There have been dozens of high-profile mass shootings in recent decades. This paper presents three main findings about the impact of mass shootings on gun policy. First, mass shootings evoke large policy responses. A single mass shooting leads to a 15% increase in the number of firearm bills introduced within a state in the year after a mass shooting. This effect increases with the number of fatalities. Second, mass shootings account for a small portion of all gun deaths, but have an outsized influence relative to other homicides. Our estimates suggest that the per-death impact of mass shootings on bills introduced is about 80 times as large as the impact of individual gun homicides in non-mass shooting incidents. Third, when looking at enacted laws, the impact of mass shootings depends on the party in power. A mass shooting increases the number of enacted laws that loosen gun restrictions by 75% in states with Republican-controlled legislatures. We find no significant effect of mass shootings on laws enacted when there is a Democrat-controlled legislature. Despite understanding that formal structure within firms is crucial for maintaining coordination and control as young firms grow, relatively little is systematically known about the initial formation of hierarchy in firms. By exploiting access to a dataset of all employees within all firms in Brazil between 2004 and 2014, we test and find support for factors that may contribute to the genesis of middle management using theories developed regarding information processing, initial founding conditions, and external environmental conditions. We also capture hires into specific functional areas and find that established theories are less predictive of the emergence of specialized managers. Above all, the size of the firm appears to have the strongest effect on the emergence of hierarchy in young firms. In Regulatory Breakdown: The Crisis of Confidence in U.S. Regulation. Ed. Cary Coglianese. Philadelphia, PA: University of Pennsylvania Press, 2012. Economic theory is clear about the advantages and disadvantages of various ways of regulating negative externalities, such as command and control, cap and trade, taxation, subsidies, and tort law. Yet public policy rarely follows the recommendations that follow from the theory. For example, the standard recommendations for reducing CO2 emissions involve carbon taxes or some form of cap and trade, but discussions of "realistic" ways to reduce emissions in the U.S. have involved mileage standards, command and control regulation of power plants, and tax subsidies for energy efficiency. In democracies such as the U.S., policies must have at least some public support. Citizens' limited understanding of the economics of regulation can lead to lack of support for optimal policies. In studies on the World Wide Web, we document some failures, and some successes, of ordinary citizens to think through the economics of alternative policies. Among other issues, we examine understanding of the secondary effects of taxation vs. subsidies, and understanding of the role of limited information (on the part of polluters, or governments) in the choice between command-and-control regulation and tort law or taxation.